KEN YUSZKUS/Staff photo. 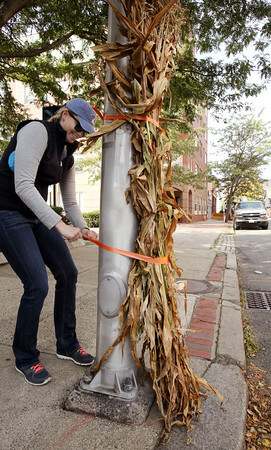 Jessica Hull ties corn stalks to a light pole on Essex Street. She was one of twenty five volunteers from the Coast Guard who decorated downtown Salem with the corn stalks on Friday. 9/25/15.